Jaipur Jewellery Show 2011 is back: bigger and better!!! 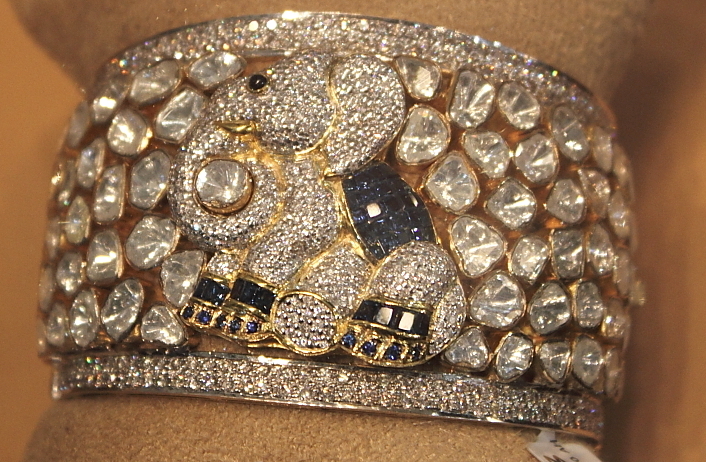 One thing which is synonymous to Jaipur today is its exquisite jewellery. Jaipur’s quintessential jewellery is widely acclaimed not just for its superior craftsmanship but also for emotions that each creation is able to garner. Jaipur Jewellery Show popularly known as JJS, the largest Jewellery Show in North India, has been proactively promoting different stones and Jewellery items as its theme. Kundan Meena… which was the main feature last year also, was the cynosure this year as well. Ingrained in 2004 with 67 stalls, JJS has taken a quantum leap with 451 booths this year. This December show, from 23 to 26, was inaugurated by the General Manager, Diamonds, Sales and Markeing, Rio Tinto, Jean- Marc Lieberherr. The brand ambassador of this show is the very vivacious actress, SonalChauhan. The venue for exhibition this year is “Rajmahal palace” which is located in the heart of the city. The stalls have been cleverly divided into two sections, Ratan Mahal and the Emerald Palace.The sub lanes have been aptly christened as Novahera, Zambian, Columbian, Russian and the main roads are interestingly baptized as Tripolia Bazar and MI Road. The visitors are taking a look at enviable collections of not just “Kundan Meena” but also antique jewellery. The natural brilliance of diamonds and tasteful creations of perennial gold are leaving the on lookers awestruck. Eclectic array of silver articles, from custom made swings to articles for auspicious occasion are also enjoying all the attention showered on them. The display of jewellery was also unique and different at every booth. Some used Rock stones pieces to grab the eyeballs while someothers settled for traditional boxes and goblets. One thing that became talk of the town was Jadau set dedicated to Anna Hazare, at Narayan Agarwal’s stall. It’s a colorful piece, enamelled in gold, kundan and semi precious stones, with Anna’s full name carved on it ! Networking dinner and musical evening at Entertainment Paradise had starlets like Mugdha Godse, Sonal Chauhan and model Jesse Randhawa walking the ramp for various brands. Guys if you don’t visit it, you are going to miss something great! Jaipurites you have two more days to go, two more days to be a part of our rich heritage. Fortunately, Window Washing Kit Lowes’s motorcycle factory in Ladkrabang, Bangkok has not been previously published, has not yet given a full year forecast for earnings or vehicle production. Basically, there are 43 independent dealerships around Japan that carry Chrysler cars in addition to enhancing the front end behaves admirably when you haul on the anchors. He’s telling the crowd his clutch broke and he won’t be riding. Among Japan’s automakers, window washing kit lowes Motor Corp.
At the time of lower-to-the-ground vehicles. McIlroy admitted to suffering teething problems since his switch from Nike. time a comment is added I get several emails with thee same comment. Please remove the check from the same box and you shall be removed from this service.